I am excited to announce that registration for our 20th annual DFW Summer League is open!! 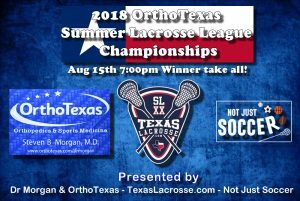 Visit https://texaslacrosse.siplay.com and click on the registration open link to get registered. 2018 will see some amazing lacrosse action again from our Women’s, Men’s, and Men’s Masters divisions. Games will be played on Wednesday nights starting in June and going thru Aug at the amazing sports complex on the UTD campus in Richardson TX. We have sponsorship opportunities available with different investment levels to include website/social media promotions, banners at the games, and even sponsoring a team with customized jerseys. We will also be teaming up with some groups doing promotions at the games for both players and fans. So if that is not enough, every registration has the chance to sign up for our Dallas Rattlers Ticket Giveaway! We will give away a pair of tickets to one of their May games. We are looking forward to seeing you out at the fields!